The Board is scheduled to take up the topic at the front of its meeting and then turn to a public hearing on proposed revisions to the county’s animal control ordinance and on two rezone requests and five special exception variance requests for Hots BBQ and an adjoining reception hall in the south of the county. At the Board’s last regular meeting in December, citizens had to wait out a lengthy discussion of the salary issue and a whole list of other topics before they got to offer comments during the public hearing on the animal control ordinance. At its June 2 meeting, when it approved the Fiscal Year 2016 budget, the commissioners gave all employees a 1.5 percent cost of living salary increase, but it withheld a decision on what to do with the remaining 1.5 percent salary money in the budget. Discussion of how to handle that remaining 1.5 percent has come up periodically since that time and came up full-force at the agenda-setting meeting on Dec. 15. After the 50 minutes of discussion, the commissioner agreed to meet again on Dec. 29 in a working session to try to hash out the issue–without success. BOC Chairman Melvin Davis has argued from the beginning that the remaining money should be used as merit pay. Davis has never specified who should allocate the monies based on merit. Commissioner John Daniell has offered alternatives to a simple merit allocation, including using the money to address discrepancies within existing pay grade classifications. 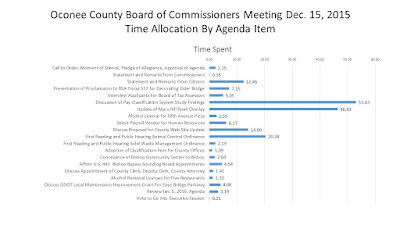 The agenda setting meeting on Dec. 15 lasted just less than three hours and 15 minutes. Agenda setting meetings, rather than the regular meetings on the first Tuesday of the month, consist of a list of items that Chairman Davis wants the Board to discuss. The four voting members can add items, but they rarely do so. The goal, in principle, is to set the agenda for that regular meeting,. The meeting begins with a moment of silence, a pledge of allegiance to the flag, and then approval of the agenda. Next commissioners and then citizens are allowed to comment on items that are not on the agenda. The order of discussion of the remaining items on the agenda is set by Davis. Davis allowed citizens to speak for just less than 13 minutes at the front of the meeting. He cut off one speaker, asking her to hold her comments on the Animal Control Ordinance until that item came up on the agenda. That happened more than two hours later. Davis allocated more than seven minutes to honor Boy Scout Troop 537 for putting holiday lights on Elder Mill Bridge, the fifth time since July 1 he has selected someone or some group to be honored at the beginning of a meeting. Last year, during that period, the Board honored four such groups. When the Board turned to the proposed changes in the animal control ordinance, four persons, myself included, asked to speak, and the four of us used up just less than 16 minutes. At least one person who had come to speak already had gone home. Davis tried to cut one of the speakers off because she wanted to continue a discussion of tethering, which is not in the proposed ordinance. She ignored Davis and spoke on tethering anyway. 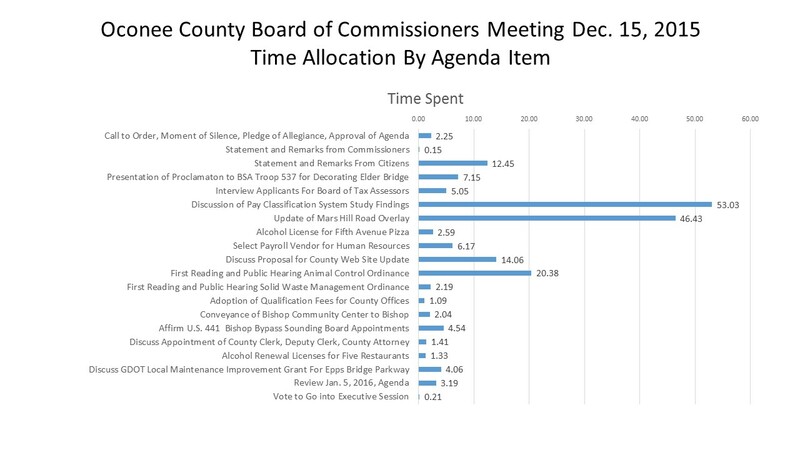 Out of the total 195 minutes consumed by the Dec. 15 meeting, citizen comments made up less than 30 minutes, or about 15 percent. The Board devoted more than half of the meeting to the discussion of pay and the Mars Hill Road overlay district. It didn’t reach a conclusion on either, and is to meet in a work session at 10 a.m. on Friday to discuss the overlay district proposal. The rezone requests before the Commission tomorrow night are designed to bring Hot Thomas Bar-B-Que, a famous south Oconee family restaurant operating since 1984, into compliance with Oconee County zoning ordinances. Both facilities are operated by Mark Thomas, a member of the Oconee County Board of Education and of the county’s Industrial Development Authority. The variance requests are designed to allow Thomas to operate without greatly changing the environment surrounding the facilities for parking, setbacks and buffers. The Planning Commission on Dec. 14 recommended approval of the rezones, but, by law, it did not take a stand on the variance requests. The Board of Commissioners meetings is to begin at 7 p.m. at the Courthouse in Watkinsville. The public will get a chance to comment on amendments to the solid waste management ordinance in addition to on the animal control ordinance. Details of the solid waste management ordinance have not yet been released to the public. The Board should take final action on a request by Fifth Avenue Pizza, 1260 Mars Hill Road, north of Butler’s Crossing, for a beer, wine and distilled spirits license.